Are you sold on a career in welding but still need to get your parents on board? If they’re like most parents, your mom and dad will probably want to know how much a welding program costs and, even more importantly, what a career in welding means for your future. 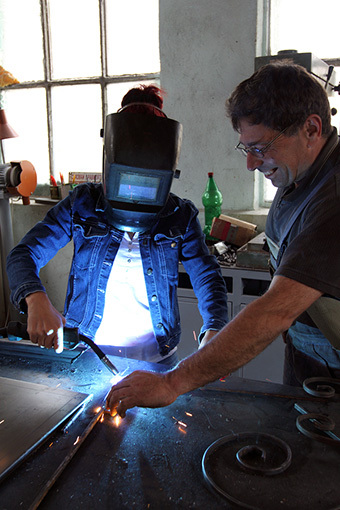 Get the facts before you talk to your parents about enrolling in a welding school program. There are some common questions about becoming a welder and welding school. Knowing the answers to them can not only help you make an informed career decision, but also educate your family and hopefully gain their support. A lot less than a university. Four years at a state college costs $93,640 on average. The same amount of study at a private university could set you back $185,088. Even community college can be pricey, especially since most students take six years to earn their degree. At $10,000 a year, that’s $60,000. And what about welding school? Just $33,000. That’s the average cost of a trade school degree. Factors that can influence the cost of welding school include tuition, housing and living expenses and textbooks and equipment. Depending on your background, grades and financial need, you could qualify for federal and state funding to help pay for your welding education. There are also scholarships available for students of welding schools. What Do You Learn in Welding School? Not English or history or the other general education classes you would have to take at a community college or university. In welding school, the training focus is on one subject: welding. Students receive hands-on welding training in the same welding processes used across the industry. They also learn important welding safety practices, how to read blueprints and inspection and quality control guidelines. With its singular focus and streamlined approach, a welding program can be completed in as little as seven months. The training is hands-on. And the teachers bring industry experience and knowledge into the classroom. Is Welding a Good Career? One of the most important considerations before investing in a postsecondary education is whether or not a good job waiting will be waiting for you after graduation. With many older welders retiring and not enough men and women replacing the welders who are retiring, the pool of available talent is shrinking. This is a big issue for an industry that’s expected to create at least 5,000 new jobs every year in the U.S. By 2024, the American Welding Society expects a shortage of about 400,000 welding operators. Not only could you have excellent job prospects as a trained welder, but you could also above-average pay, benefits and a pension. In Florida, the city of Miami is hurting for skilled workers to support its building boom, and employers are upping the ante to fill positions with such perks. And guess what? Employers across the globe report doing the same. The key to taking advantage of all of these opportunities in the welding industry is training, as the Bureau of Labor Statistics reports that employers these days would rather hire applicants with postsecondary training. The agency also indicates that welders can enjoy the flexibility to shift from one industry to another, since most fields require the same basic skills. Does Welding School Help With Job Placement? Many welding schools offer student support and career advising services. These range from help with obtaining financial aid and scholarships to finding student housing and part-time jobs. Graduates can also take advantage of help with preparing resumes, searching for jobs, getting ready for interviews or employer tests and more in the school’s career services department. Earning the support of your family members to enroll in welding school is possible if you convey these talking points to them. Ultimately, however, it’s your career—and your decision. If you have more questions about a potential career in welding, contact TWS today.